The following diagrams are useful aids to understanding the wave structure of matter. But they are only approximate, you need to use your imagination too! 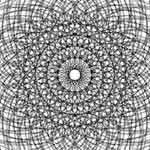 (It is very hard to draw spherical waves on a flat computer screen!). The comments and diagrams below relate to the most simple form of matter, the electron or positron (antimatter is just the opposite phase standing wave to matter). 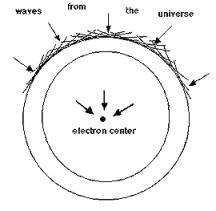 Each wave center 'particle' is at the center of its observable universe within infinite space. We can represent how space vibrates by using plane waves flowing through space in all directions, resulting in the formation of spherical standing waves around the wave center 'particle', as the following diagrams show. These diagrams show waves from 8 different directions. When you combine them you get the image below. You can clearly see the spherical effects starting to form (circles in 2D, you must imagine it in 3D), and interestingly you also see opposite phases (positrons and electrons) being formed. This diagram is an approximation (only shows the out-waves). 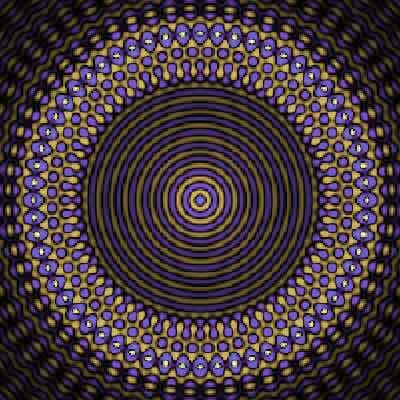 It gives you some idea of the 'secondary' wavelength (the 'electromagnetic' wavelength of light) caused by the interactions of the spherical In and Out-Waves of the two electrons (wave-centers) when they are bound in atoms / molecules and thus have some repeating wave pattern that sets up the resonant coupling. The diagram should actually show the wave patterns changing - one electron would move to a lower energy wave pattern (emit a 'photon') the other electron would move to a higher energy wave pattern (absorb a 'photon'). This process is limited by the velocity of light which is simply the velocity of the spherical in and out waves flowing through space. Some Ideas for Better Wave Diagrams! It would be nice if a few people with talent for creating wave diagrams could share their ideas and skills to create a variety of wave diagrams. 1. 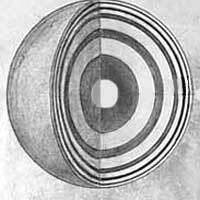 The electron - spherical and cross section, showing in and out waves forming a spherical standing wave. 2. Charge - Waves are non-linear and travel faster with higher wave amplitude. Thus you can show that for two electrons that are in phase, then their in and out waves between them have a higher wave amplitude, travel faster, and thus cause wave centers to reposition further apart over time (like charges repel). 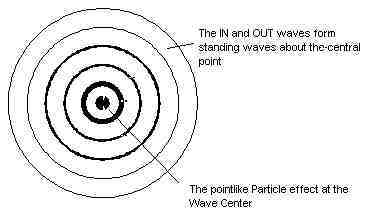 For an electron and a positron the opposite is true, the positron (antimatter) is just an opposite phase standing wave to the electron, so the waves between them cancel, have lower wave amplitude, and travel more slowly causing wave centers to form closer together. 3. Light - need to take into account high velocity de Broglie phase wave that determines allowed wave function / pattern of electron in atom / molecule - while also showing how two electrons in different atoms / molecules can resonantly couple and change their respective wave patterns (emit and absorb discrete amount of energy / photon of light). 4. Gravity - slowing of in-waves causing them to change ellipsoidal shape (Einstein's curvature of 4D space-time) and which also changes location of wave center over time (with each successive in-wave the wave center repositions itself in the direction of slowest incoming spherical waves - and waves travel slower where there is more matter / higher wave energy density of space). We are currently working on this at the moment (will add stuff here once complete) - looking at how light curves as it passes the sun to calculate how the mass of the sun compared to the average mass of the universe slows the wave velocity. 5. EPR / Non Locality - de Broglie phase wave where velocity is c^2 / relative velocity, so very fast at low relative velocities, to explain faster than light (non local) interactions. 6. Cosmology - Huygens' principle and the formation of in-waves from the out waves of all other matter in a finite spherical region of space (our observable universe) within infinite space. Anything else that you think would be useful??! !